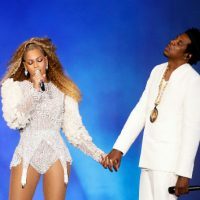 2018 Parkwood EntertainmentBeyoncé and JAY Z lived up to the name of their duo album, Everything Is Love, as they celebrated Hova’s 49 birthday Tuesday in South Africa. Queen Bey led the crown in singing “Happy Birthday,” and Jigga was all smiles. Beyoncé’s mother, Tina Lawson, paid tribute to the Roc Nation CEO on Instagram, posting a photo of him at the Global Citizen Global Citizen Mandela 100 festival Sunday in Johannesburg.